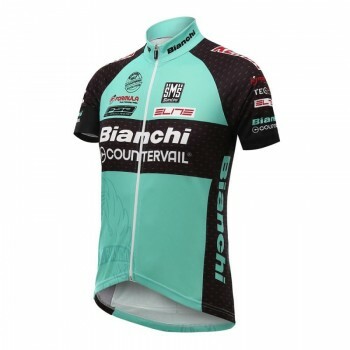 Bianchi Counterveil Team Short Sleeve Jersey designed and made in Italy by Santini using the most advanced fabrics. Ours is a long and storied history. It starts in 1965 when Pietro Santini established Santini Maglifico and began to create knitwear, specializing in clothing for cyclists. It continues today as Santini cycling apparel is worn worldwide by everyone from the cyclists in your local club ride to top professional teams and organizations (like Vacansoleil, Katusha, Green Edge, the Giro D' Italia, the UCI, and others) alike. Everything in between those two milestones is, as they say, history. To understand us is to first understand that we continue to make one simple choice about how we work; we design and produce all of our products exclusively in Italy. When you choose to ride Santini, know that it is our passion for craftsmanship that you're feeling, our pride in our work, our commitment to the research of innovative materials and new production methods.